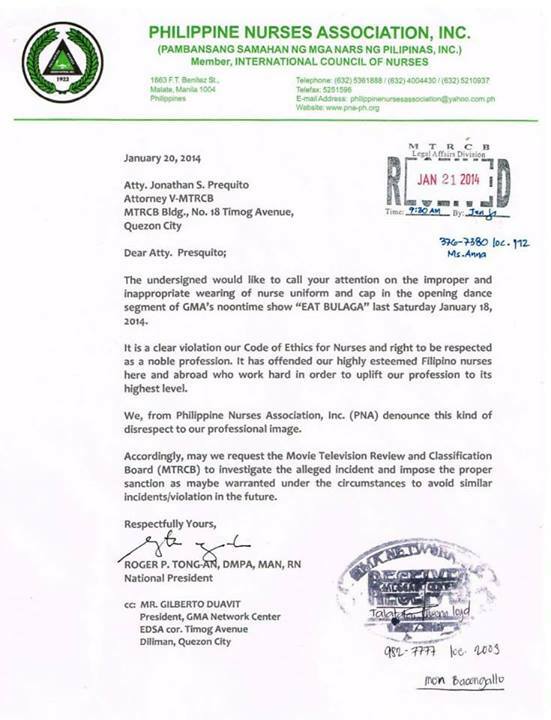 This entry was posted on Wednesday, January 22nd, 2014 at 1:12 am	and tagged with complaint against eat bulaga, eat bulaga dancing nurses, eat bulaga filipino nurses, eat bulaga mtrcb, eat bulaga nurses, eat bulaga pinoy nurses, philippine nurses association and posted in filipino nurses, journalism, philippines. You can follow any responses to this entry through the RSS 2.0 feed. My mom is a nurse by education and I found this news disturbing. Yes, the uniforms signifies the dignity of a profession. This is not the first time that Eat Bulaga committed the degradation of such a dignity. Naalala mo ba yung commercial nina Jose at Wally na Winrox na may sumsayaw na mga nurses pero pinatanggal na at pinaikli yung TVC after the complaint by PNA?